“You have colorectal cancer”. The sound of those words and the sight of a full color, very ugly photo of a big lumpy mass blocking my otherwise nice clean colon landing in my lap, changed my world in an instant. That was on October 4th, 2012 and the following 10 weeks or so would consist of an emotional rollercoaster and a very significant makeover in my thought process. I got lucky and my prognisis is very good. But during that time, while I faced the reality of my own mortality, I began a process of re-evaluating everything about my life. First and foremost, I focused on how much I truly cherished my family. I also started to sort out what I now knew to be truly important and separate those things from the things I used to think were important. I got in touch with my values and began to write down what I really wanted to do with my life if God gave me a second chance. What did I truly derive happiness from? How should I fill my days in order to extract the greatest value from each and every one? What I have missed in my 55 years? I found myself drawn to the culture and lifestyle of my Italian heritage. The celebration of life, and the sharing of experiences with family and friends. I began to write down all of the things I remembered so fondly from growing up in an Italian family. This made me happy and was the first time since my diagnosis that I could think about living again. I reached out to cousins and family members to reconnect and I dug deeper into the research I had begun (and then dropped) on my Italian ancestors. I decided to begin sharing my new perspective through a blog and started to outline what a book might look like. I have a long way to go and I have to go back to Italy in order to complete the project. 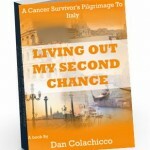 I have decided to title the book “Living Out My Second Chance. 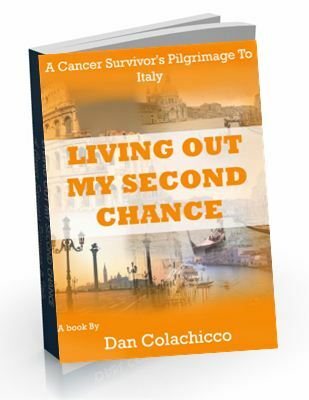 A Cancer Survivor’s Pilgrimage to Italy”.